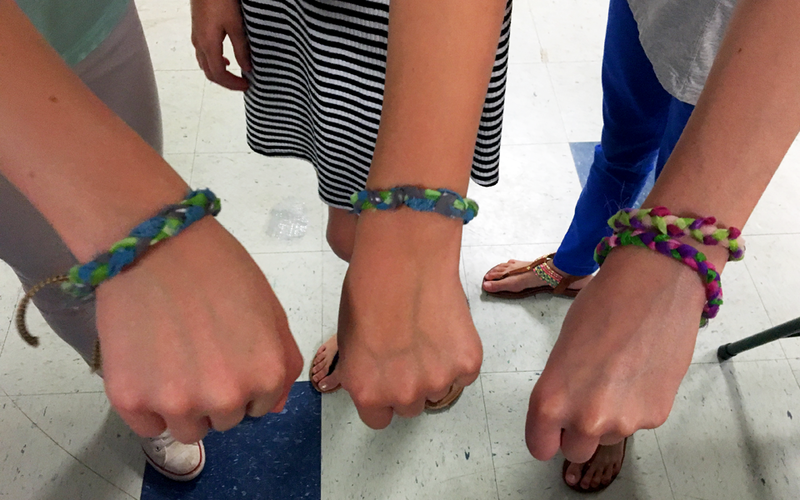 SCRAPPY HOUR PARTIES AND DROP-IN CREATIVE FUN! STEP ONE: To book one of our programs, please complete our online form. Please allow at least three-weeks notice for parties and be aware that completing the form is NOT confirmation of your request. We make every effort to respond to your inquiry within 72 business hours. STEP TWO: Once you receive notice of your booking, a $30 non-refundable deposit is required to hold the reservation. The remaining balance is due on the day of the party. Questions? Contact Anna Graves, Outreach and Education Manager, at events[at]scrapexchange.org. Add a Birthday Brick on our Yellow Brick Road! For an additional $75 (total cost $260 for a 1.5 hour party; $290 for a 2-hour party), you can celebrate your big day and support creative reuse by purchasing a personalized brick on the Yellow Brick Road that encircles our campus. A brick gives you a permanent reminder of your time spent at The Scrap Exchange, and the funding supports improvements and additions to The Scrap Exchange’s facility and campus. Drop-in Open Studio is offered in both of our community maker spaces. Make N Take Room: Individual and families can use the Make N Take room anytime during store hours when group programming is not taking place. Please call ahead and make sure the room is available at (919) 401-0553 before arriving, as group program bookings are frequently added and/or changing. Design Center: Our Design Center is best suited for teens and adults. Prior to using the center, you must attend an orientation session to learn proper use of the equipment. If you already know how to sew but need orientation on our machines, we offer this training during our free community sewing meetups on 3rd Sundays and every Wednesday (see below). Once trained, you are added to our list of drop-in Design Center users and you are free to use the room anytime during store hours. Creative Classes and Meetups: The Design Center also offers a wide variety of classes, workshops, and meetups throughout the year. Altered Book and Papercraft Meetup: Every second Monday of the month, 4:30-6:30 pm. Whether you’re into altered books, art journaling, paper folding & cutting, or book sculpture, this is the group for you. Beginners welcome. 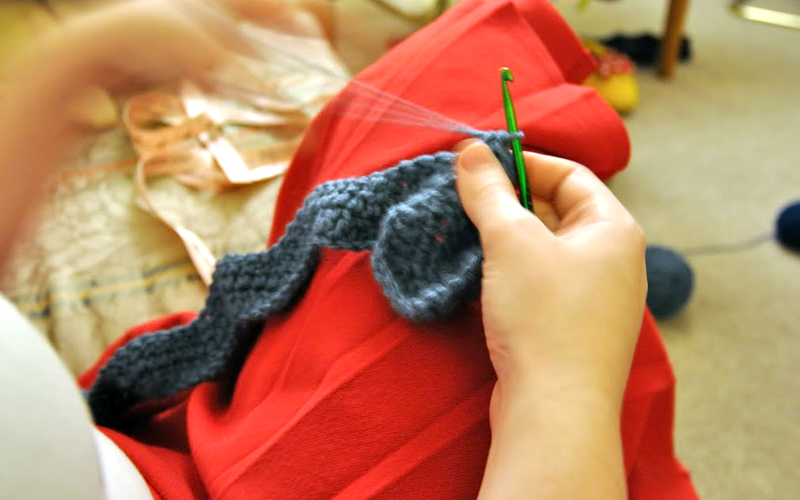 Sewing Meetups: Every third Sunday, 2-6 pm and every Wednesday from 4:30-6:30 pm. 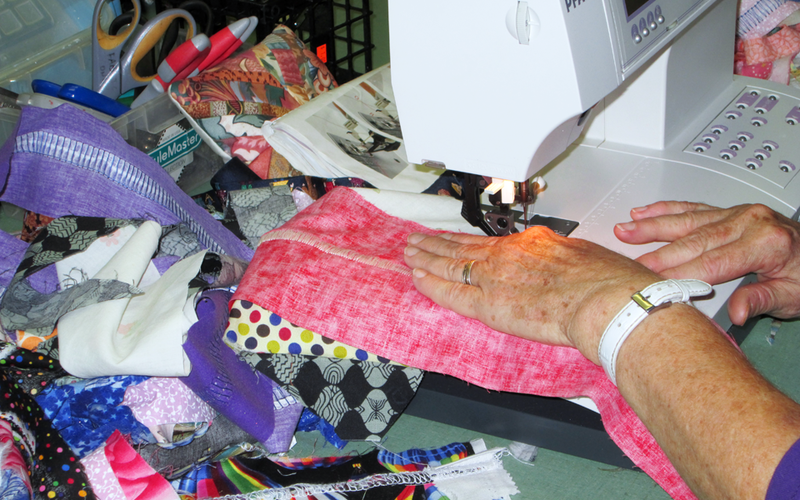 Join us for a community sewing meetup hosted by textile artist Christine Ramsey. Sewing machines are available for use, but materials are not included. Drop-ins welcome! Space is limited, so please arrive early! Ages: 14+ (youth 10+ welcome to attend with an adult). Creative Classes: For $10 per hour of instruction, our experienced teachers share their creative knowledge. Our creative classes are focused on teaching participants skills and how to creatively reuse materials. 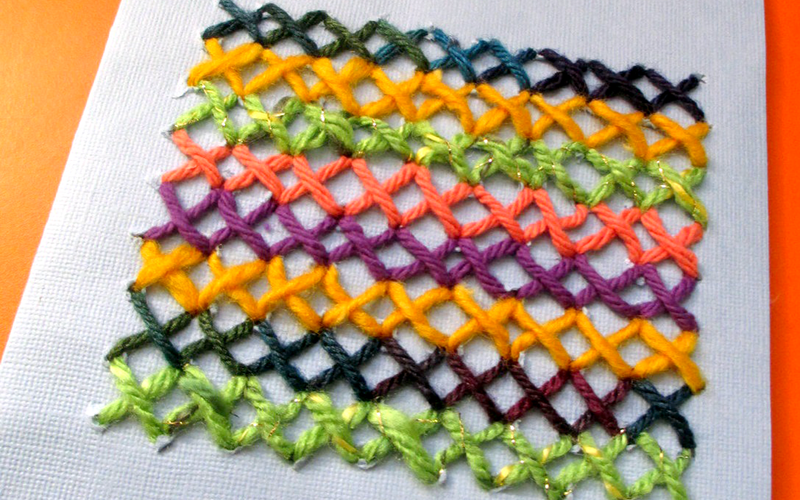 Visit scrapexchange.org/programs/classes/ for an updated list of available classes. Want to refresh your work group or get your team’s creative juices flowing? We can bring our famous creative reuse programming to you! 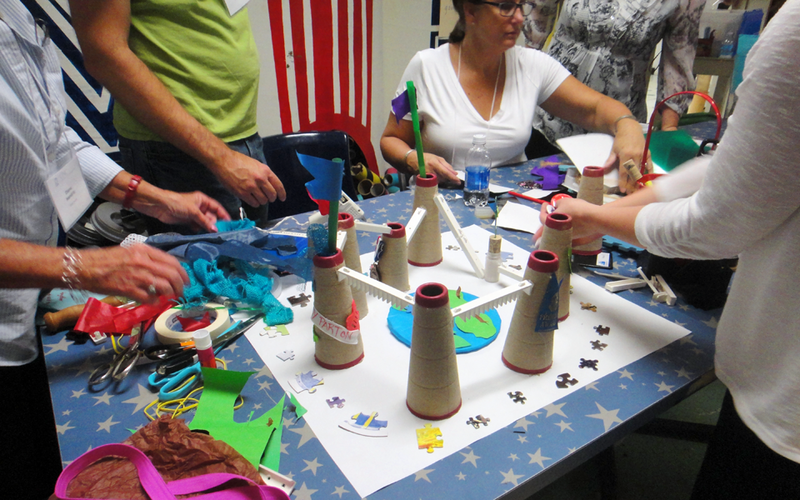 Participants will work collaboratively to design and build a thematic art project using our fun, colorful, and unique materials. At the same time, they’ll enhance their collective creativity and problem solving skills. Participants design a team, department, or company banner using the unique supplies provided. Each banner element should communicate their purpose, values, audience, and work culture. Smaller groups collaborate on particular components, and then all pieces merge for the final product. Engage your colleagues to change the world through community service and civic engagement. We offer service projects as an auxiliary activity to the creative team building program. Your team can engage with one another as they support our organization’s mission. We are grateful for the support of many volunteers to process materials and organize our facility. Let our staff can design a program specifically for the needs of your organization. An additional consulting fee may apply. Call us for more information and a quote. $50.00 per person for a 2 hour program, 40 person maximum. Off-site programs more than 20 miles from our location may require additional fees for mileage, travel allowance, and/or accommodations. STEP ONE: To book a team building program, please complete our online form. Please allow at least three-weeks notice for your event and be aware that completing the form is NOT confirmation of your request. We make every effort to respond to your inquiry within 72 business hours. STEP TWO: Once you receive notice of your booking, a $30 non-refundable deposit is required to hold the reservation. The remaining balance is due on the day of the event.